ZEBULON, NC - The Atlanta Braves announced several player transactions today with two affecting the Carolina Mudcats active roster. The roster moves included the placement of LHP Michael O'Neal on the Carolina disabled list and the transfer of RHP Andrew Thurman from Double-A Mississippi to the Mudcats. The Braves additionally announced on July 19 that LHP Chase Johnson-Mullins was transferred to the GCL Braves after being reinstated from his suspension. 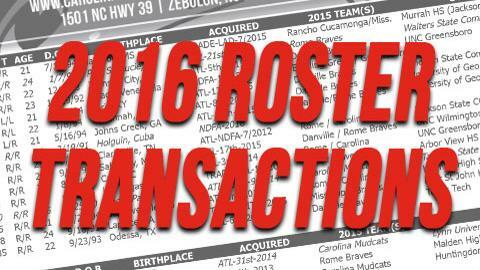 The Mudcats roster is currently at 25 active players with seven players on the disabled list. 7/20 - LHP Michael O'Neal placed on Carolina disabled list. 7/20 - RHP Andrew Thurman transferred from Mississippi to Carolina. 7/19 - LHP Chase Johnson-Mullins reinstated from suspension and transferred to GCL Braves.